Get ready to sleep like you have never slept before. 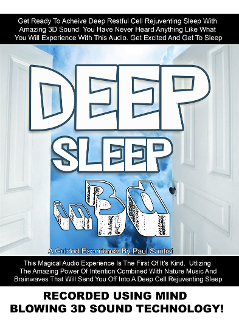 This audiuo is the first of it's kind to untilize the power of intention with 100% nature beatiful music and brainwaves to get you calm, creative and off to sleep all in amazing 3d sound. Countless affirmations will guide from everywhere all at once into the best sleep of your life. Wake up energized, focused and with purpose to take on each day. An absoultley amazing experience guaranteed!